Words of the Wise Acres: Rural High-Speed at the 150: A Schism or Controlled Marketing? Rural High-Speed at the 150: A Schism or Controlled Marketing? At no point do they mention the NetworkBC programme, or BCWireless (our ISP). I mentioned it before as it allowed us to move here. Availability of high-speed was a stipulation on our purchase offer, as my job depends on it. However, a suspicion has arisen in me. BCWireless's web site is a little out of date, and indicates that a 150 Mile House roll-out is planned. However, if you view the more current PDF, that no longer appears to be the case. But it seems the infrastructure's there: Telus's own published roll-out schedule states this has already occured, as does their interactive-but-poorly-designed map. 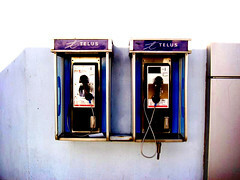 As I understand it, the NetworkBC agreement assured that participants would not have to worry about competing against Telus. With no other ISP listed, is Telus now the only potential high-speed ISP for the 150? To possibly reinforce this suspicion, let's considerer that Telus is also a wireless vendor who would happily provide users with higher-cost-to-the-subscriber/lower-cost-to-the-vendor (no last-mile worries) wireless high-speed. Telus Mobility has excellent coverage throughout the Hwy 97 corridor, which is where 150 Mile House lies. Therefore, I believe that although it's far more likely Telus' PR people don't know what is actually happening in the world of high-speed internet (or they would have happily touted how much they are helping), there's a possibility they are planning to roll out a residential wireless high-speed service to through Telus Mobility and aren't ready to talk about it.